The image is a screen shot of the new side-by-side comparison map in the data visualization tool. The map on the right displays the 2018 WaterSMART projects, and the map on the left displays all previously funded WaterSMART projects. Through WaterSMART, the Bureau of Reclamation works with states, Tribes, water managers, and other entities as they plan for and implement actions to increase water supply reliability. In addition to cost-shared grants for water management improvements, Reclamation provides shared information and tools with water managers through WaterSMART to support water supply reliability. Below are highlights including recent updates to the WaterSMART Data Visualization webpage, and two new data platforms, including a Technical Review of Smartcontrollers and an Irrigation Demand Projections tool. The WaterSMART Data Visualization Tool, created in 2016, is an interactive, online map that visually displays the locations and benefits of WaterSMART activities to our customers, stakeholders and the general public. The interactive web map highlights program accomplishments and allows users to filter information about specific project types and identify recently funded projects. In 2018, 164 new projects were selected through Reclamation’s WaterSMART Program. Information about these projects, which support efficient water management, water marketing, drought mitigation and planning, reservoir operations, and watershed restoration, is now available on the data visualization tool. A new side-by-side comparison map allows the user to compare newly funded 2018 projects with previous funded WaterSMART projects. If you are a water manager interested in applying for a WaterSMART project, this visualization tool provides examples of the types of projects funded, as well as a visual representation of where those projects are located and how many are funded annually under each WaterSMART program activity. Click here to view and interact with the data visualization tool. Since 2004, Reclamation’s Southern California Area Office has maintained a report on weather and soil moisture-based landscape irrigation controllers known commonly as smartcontrollers. The updated 6th edition report, made available through the WaterSMART website, provides technical background on smartcontrollers and how they function, as well as product information from 25 companies. The report also summarizes smartcontroller certification and testing processes and presents an unbiased overview of available products. Irrigation districts, water agencies, and others looking to increase their knowledge of smartcontrollers, or those interested in developing a smartcontroller incentivization program, might find the information within the report useful. To learn more about smartcontrollers, or to download the full report, click here. Reclamation’s new Irrigation Demand Projections website is an easy-to-use tool for accessing a large archive of historical and future Western United States agricultural irrigation water demand estimates and associated weather data. 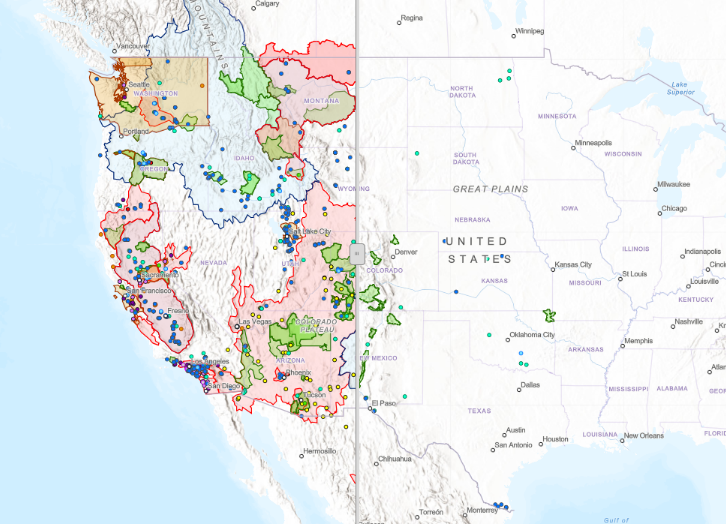 The website, developed by Reclamation’s Technical Service Center, Water, Environmental, and Ecosystems Division, is formatted as a story map that provides point-and-click access to the large data archive. The archive is organized by Reclamation’s major river basins and the watersheds within each basin. The irrigation demand estimates are intended for use in planning and operational studies, water rights transfers, economic analyses and more.